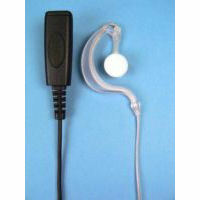 The centre part of the G-shape can be slid up and down, this enables the earpiece to fit any size of ear comfortably. The earphone gives crystal clear audio. Suitable for Motorola Kenwood Icom Vertex Maxon HYT Entel and more.